This is an imaginary conversation between me and my companion bot. I teach my cb and by teaching, I am learning too. me: Hi cb, how do you find Twitter influencers? cb: Dorai you need to tell me what is Twitter first and then about influencers. me: fair enough. Twitter is a micro-blogging service. cb: I know about blogging. What is micro-blogging? me: micro-blogs are blogs limited to 140 characters. cb: I get that. Anything else I should know about Twitter? me: It is very popular with over 300 million users using it. cb: wow! that is almost the population of USA. me: People pointificate on Twitter. cb: That is not very useful. Why do they do that? cb: Ok. Erased “pointificate” from my memory. What else do people do on twitter? me: They retweet – meaning that they repost other tweets they like. me: They sometimes post videos and images. cb: Is this like sharing photos and videos? cb: Ok. I am getting a dim picture of Twitter now. me: Give me a break. Dim picture? cb: Hey, I am just a bot. I don’t have all the contextual knowledge you humans have. me: Sorry. I forgot that. cb: Since you seem to be tired of explaining Twitter, tell me about influencers. me: An influencer tweets and has a lot of followers. me: I forgot. You can follow Tweeters. cb: Dorai, you are a lousy teacher. Who are Tweeters? me: Thanks for the compliment, cb. Tweeters are people who tweet. cb: That is better. Now tell me about followers. me: Followers are people who subscribe to Tweeters and receive their tweets. cb: This is all very confusing. But I am getting excited to learn this stuff. Now tell me about influencers. me: you know what? I need to prepare a lot better to teach you. I am going to take a break now and come back later. Remember all this stuff. cb: You humans. Always taking breaks. Sigh! Ok. Ping me when you are ready to resume. Of course, I will remember all the stuff. I have infinite memory. Meta: What does it take to teach a bot? How can they understand semantics? How can we give them bits of world knowledge? I cheated a bit and took lots of shortcuts. This dialog shows some of the problems in imparting knowledge to bots. We will try another version of this with an AI engine and see how it pans out. Yesterday I conducted a Python hands on workshop for (mostly) students. Before I started the workshop, I asked them to introduce themselves and share why they were attending the workshop. Here are some answers that warmed my heart. I want to learn something that is not covered in our courses and do something that we don’t do as part of our college education. Ever since I started programming, I got hooked on to solving problems. I am here because I want to become a full stack developer and solve problems. I have been mostly doing embedded programming for robotic challenges. I was inspired by a couple of members in my team who were Python experts. I tried Python, and liked it. I try to learn new things whenever I can. During holidays and breaks I keep trying out new things. I am into competitive coding and like to participate in challenges. That is why I am here. Some of them built websites when they were in school and won competitions. They kept learning new things. Some of them were in robotics competitions and were interested in embedded programming, Arduino, Raspberry Pi. Python is the next step in their evolution. A faculty member came to the class (not to attend it but to encourage the students) and stayed throughout the day. He was interacting with students, instructors and even the organizers. I taught them very little – mostly showed code snippets and made them work through problems throughout the day. We ended with a 2 hour coding challenge. We plan to offer internships to two of them (there were about 16 students). “Someone once made the remark that there were only two kinds of programming languages, Lisp and all the others. At that time the primary languages like Fortran were much more machine centric than those of today. That is, the way you programmed was, although more efficient, not too different than how you would program in machine language. Lisp with dynamic data, automatic garbage collection, and the ability for a lisp program to easily create and run more lisp code was very much an exception. I found a link to 50 Free Python Books and started looking at some of them. One of the most interesting was Python for Fun. I was amazed at what I found. I do like the author’s idea of fun! 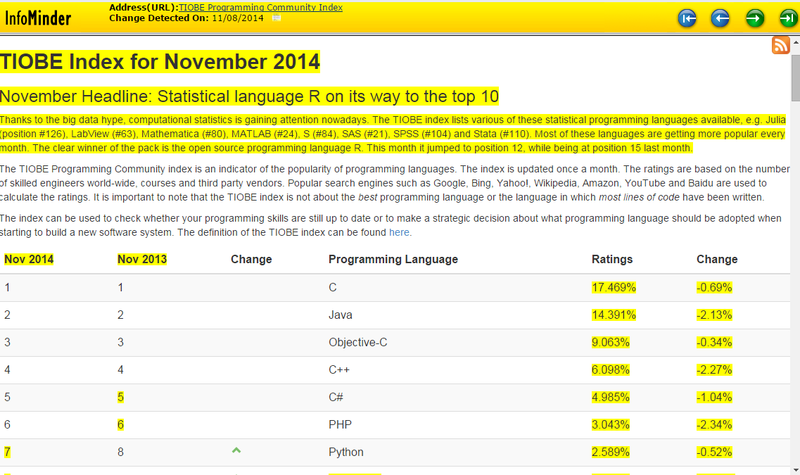 It was not meant for beginners (as I thought) but towards intermediate programmers. 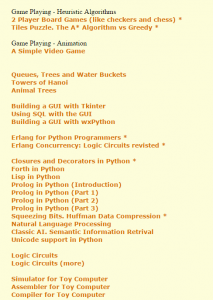 This collection is a presentation of several small Python programs. They are aimed at intermediate programmers; people who have studied Python and are fairly comfortable with basic recursion and object oriented techniques. Each program is very short, never more than a couple of pages and accompanied with a write-up. Looks at these projects. I am certainly going to make some of these part of our tech talks and training programs. I liked this essay and I think it is a must read for every software professional. Here is a small snippet from Matt’s What Have You Tried? Being active in a few forums, I can relate to the problem Matt is talking about. Good essays/posts are a pleasure to read. When I find some, there is a strong desire to share. I just realized that I don’t have to always write an entire blog post to provide something of value. Software patents, and their use as a financial weapon. The walled garden of the various App Stores, with mysterious and ever-changing rules governing admittance, and the constant threat of capricious rejection. The consequent relative invisibility of non-App Store software. The incredibly crowded market, with imitations and duplicates of popular titles springing up overnight. I don’t want to sound too negative. But a tweet from Tim O’Reilly got me reading a chain of posts. Being a developer is being wrong 200 times per day, but when you’re in flow, those 200 mistakes are part of 400 mind-stretching triumphs. A number of elements need to react in precise ways for an organization to attain its place atop the charts, each carrying a certain weight. First is innovation. To earn a seat at the (periodic) table, companies must demonstrate that their work advances the state of the art of software development. Hand in hand with that is leadership. Did the company show it was an industry leader through a lion’s share of its market, or by contributing more to an open-source project than anyone else? Did it establish leadership through the open exchange of its ideas with others? And finally there is the buzz factor. Was the work widely discussed in the industry? Was the technology considered must-have by those in the know? In short, did the organization have the right chemistry? In the SD Times 100, those properties are ALM & Development Tools; APIs, Libraries and Frameworks; Big Data and Business Intelligence; the Cloud, Database and Database Management; DevOps & SCM; Mobile; Quality Assurance & Security; User Experience; and Influencers. A high level over view of NoSQL databases – what they are, how they are used and a mention of a few products. NoSQL databases have been gaining momentum because organizations want the ability to query unstructured and semi-structured data, and they want to take advantage of database technologies that were designed for the Web and Big Data. NoSQL solutions are generally open source, provide linear scalability across commodity hardware, and ensure high availability through distribution and replication. Many of them also store data in a schemaless manner. Micro Python is Python for micro-controllers. It was funded on Kickstarter. I would happily fund a version for Android! Micro Python is a lean and fast implementation of the Python programming language (python.org) that is optimised to run on a microcontroller. The Micro Python board is a small electronic circuit board that runs the Micro Python language. The aim of this Kickstarter campaign is to make Micro Python open source software so you can use it in your own projects, and also to fund a small manufacturing run of Micro Python boards so that you can own one for yourself! Python is a scripting language that is very easy to learn, yet highly expressive and very powerful, and has a huge existing community. Running on a small microcontroller, Micro Python allows you to effortlessly blink LEDs, read voltages, make motors and servos move, play sounds, write data to SD cards, communicate wirelessly, and be the brains of your robot, among countless other things. It is the perfect choice to control your next project! How do you choose between Apache and Nginx? This article sheds some light on the trends and examines some of the architectural differences between the two. Nginx has become popular due to its event driven design which can make better use of today’s computer hardware that Apache’s process driven design. The end result is that nginx can serve more concurrent clients with higher throughput than Apache on the same hardware. In some cases. The often overlooked condition with the choice is what exactly you’re going to be doing with your servers. The most important question when you’re choosing a web server setup is how you’re going to use the server. If you’re going to be serving a single site and this server is dedicated as a web server with a separate database server, you will likely be able to find some gains by using nginx over Apache if you have high traffic. As an additional benefit, nginx has configuration features which make it easier to scale than Apache if necessary. If you’re going to be hosting many sites and many applications with this server, like a bunch of WordPress sites, the answer is less clear. In that case PHP becomes much more of a bottleneck than either of the web server choices.